In a recent media release, Huawei Marine used this sentence “Building the backbone for Global Connectivity” to describe their activities in the submarine domain. Submarine fiber optic cables have become backbones of the digitally connected world. Datacenters, Storage devices and end-users accessing to multiple locations spread all over the world, truly make a digital global community. Submarine fiber optic cables carry the signals across the continents that make the communications faster and simple, which otherwise would have been complicated and expensive and interrupted over the Satellites. Submarine fiber optic cables are connected to the terrestrial cables in different countries. The landing stations interconnect the submarine cable with the terrestrial cables. Overall, the whole network looks like a nervous system. The global digital economy is dependent on submarine cables. 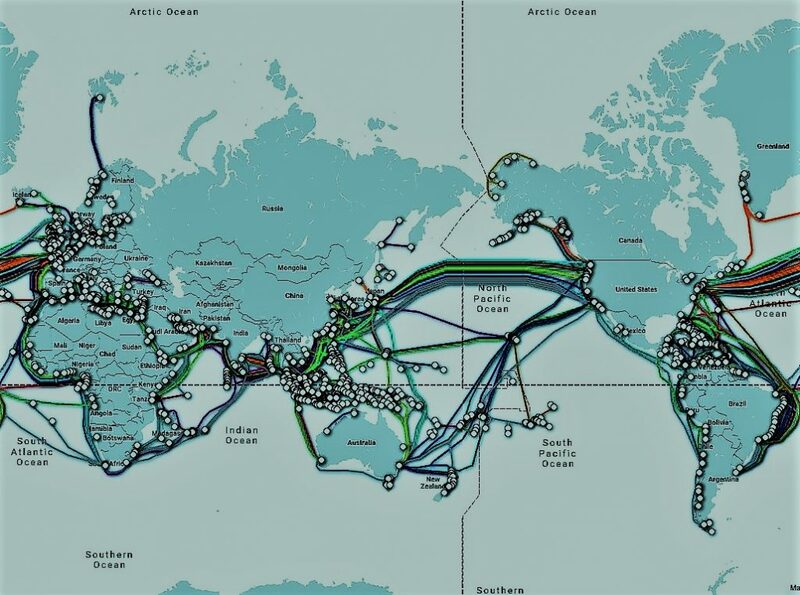 No longer just connectors of population centers, these cables now link the numerous data centers located around the world to facilitate global commerce. Submarine cable systems are viewed as critical infrastructure both for nations looking to develop as ICT hubs and enhance their economic growth and for the basic innate human desire to communicate and share ideas in today’s connected world. A submarine fiber optic cable is an optical fiber cable laid on the sea bed between land stations to carry telecommunication signals. The first submarine communication cable deployment was done in the 1850s (transatlantic telegraph cable which became operational on 16 August 1858). Submarine fiber optic cables for the deep-sea sections of the network these days typically have a diameter of 25 mm and weigh around 1,400 kilograms per kilometer. Larger and heavier cables are used for shallow-water sections near shore. It is estimated that there would be 20 billion connected devices worldwide by the year 2020 which will grow to 75 billion by 2025. This along with the innovations in Cloud computing and other data-intensive applications and the creation of huge contents accelerate the demand for capacity. Over the past five years, the trans-Atlantic traffic has grown 20 times. Huawei reports that the data capacity average growth rate is around 55% a year globally. In order to meet with the demands from all over the world, it is required to deploy more submarine fiber optic cables. Transmission rates have been consistently improving, thanks to the innovations driven by the equipment manufacturers. 100Gbps transmission is now common. Recent industry news reveals that 600Gbps transmission rate over a single channel is possible. Practical delivery makes take a bit more time, but it would not be very far. ← SFP vs RJ45 vs GBIC: When to Choose Which?